In ancient history, the Fertile Crescent extended from lower Egypt, through modern-day Israel and into Assyria and Mesopotamia. Thanks to the waterways, population density, and diversity of peoples, it was characterized by an unparalleled flow of goods and services and intellectual foment. The region's nickname, "The Cradle of Civilization" is well-deserved. Today, Harvard University is announcing that the school is finally progressing with its stalled expansion in Allston to create 700,000 square feet of new lab space and a 36-acre enterprise research campus with a dozen building to house start-ups, biotechs and VCs. If this project can be completed as planned (something Larry Summers tried to complete during his term as president, but it was stalled due to the economic crisis), it will form a modern-day, intellectual fertile crescent between Harvard and MIT's Kendall Square, linking academia, industry and capital along the Charles River. To be clear, this is not just a Boston phenomenon. The scientific progress being made in Kendall Square and throughout the region in the areas of human genomics, bioengineering and personalized medicine at the Whitehead Institute, the Broad Institute and the Wyss Institute are having international impact. If the Harvard Stem Cell Institute were to move to the new campus and sit alongside the newly created Harvard Division of Engineering and Applied Sciences, nestled next to Harvard Business School and the newly created Innovation Lab, the amount of collaboration and innovation would simply explode. Notably, each of the institutions mentioned above are 5-10 years old and thus are still extremely early in their progress in bringing to market all the implications of the intersection of the human genome project, big data, cloud computing, Moore's Law and advancements in nanotechnology. There is a big idea nestled in here. Let's hope local, state and national leaders recognize the opportunity…and seize it. When evaluating company documents and filings, a hedge fund manager friend of mine has a simple mantra: "read the footnotes". So when the Groupon S-1 was posted last night, I was eager to pour over it and find a few hidden nuggets that might explain the company's success and provide some indication of what the future might hold. I think I found it on pages 74 (not the footnotes, I grant you, but buried quite deeply in the 110 page document). The company presents two case studies for its two oldest cities, Chicago and Boston, and provides a few datapoints that allows one to infer two of the most important metrics for the business – customer churn and customers per merchant. As you can see, quarter over quarter subscriber growth is slowing considerably in Chicago. In Q1'10 it was 81%. 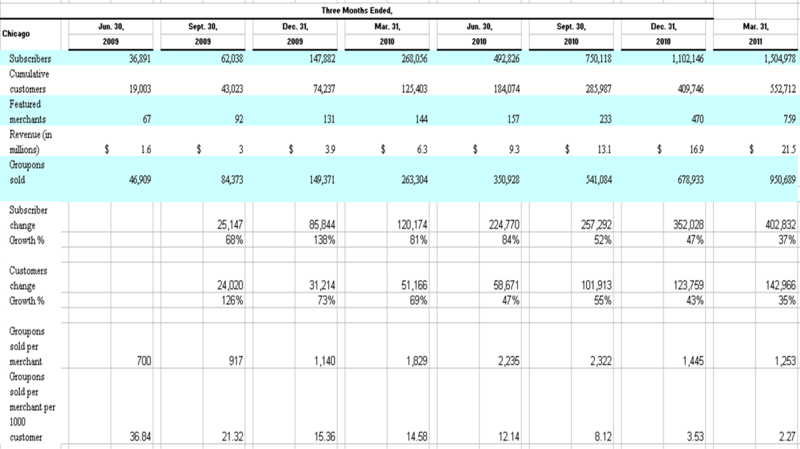 In Q1'11 subscriber growth was only 37%. This is incredibly important because there are going to be inactive subscribers – also known as attrition or churn – and that number will likely grow over time. Groupon needs to fill this leaky bucket with new subscribers every quarter. If not, growth will slow, flatten or decline. As with the subscriber numbers, this figure is slowing in quarter-over-quarter growth. In Q1'10, the change in cumulative customers (that is, new customers) was 69%. In Q1'11, it was 35%. As you can see, these ratios are also in decline, with Groupons per merchant per 1000 customers dropping 10x from Q3'09 (21.3) to Q1'11 (2.3). This ratio is a good proxy for how active the cumulative customer base is. The lower the ratio, the more likely there are large pools of inactive customers. Again, if customer engagement attrits over time, then there is a leaky bucket that can only be filled with new customer acquisition. In saturated markets, it is typical for new customer acquisition to slow down and become more expensive over time. To be clear, I'm incredibly impressed with this company and what it has achieved. But a careful read of the rations is instructive when thinking about persistence and durability of the model. Groupon has so many assets at their disposal and is so early in their innovation cycle, that I'm sure we haven't seen anything yet in terms of targeting, loyalty and other techniques to provide sticky customer relationships. But the ratio data above suggests that the basic model they're executing on right now has some weaknesses that will become more acute over time.